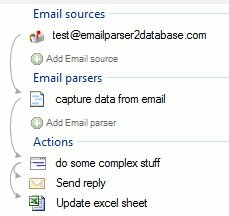 The idea behind Email Parser, as shown in the How it works help topic, is to build on the left panel a set of items that step-by-step process the incoming email the way you want. The process is run directly after the email is received. 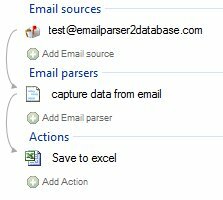 Any email parsers will be bypassed.The only fields that the process will have available are those that come by default with any email: From, To, Subject, etc.The process will be run once for every incoming email or, in the case you choose an email filter, once for every email that has passed the filter. You can also set the process to be run for the emails that have not passed the filter. 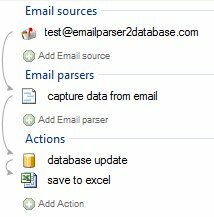 The process is run after the connected email parser captures the fields. 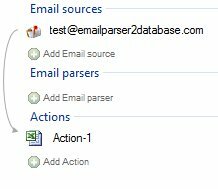 This is the most common run condition for the first process in the chain.Apart from the default header fields that come by default with any email (From, To, Subject…) the process will have the fields captured from the email parser.The process will be run once for every email that the email parser processes. The process is run after the other action is run. It will be run each time the previous process runs. The action is run only if the previous one is successfully run. It will be run each time the previous process successfully runs. 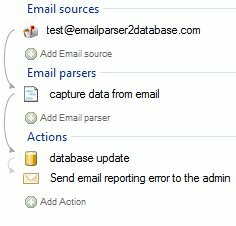 In the case “database update” fails the “Send email reporting error to the admin” is run. If “database update” successfully runs it is not run. The action will run only if the previous one does not run successfully.This is very useful to, for example, handle unexpected errors. Note that the arrow in this case is slightly brighter. It will be run each time the previous process fails. Scripts like “do some complex stuff” can call any other processes connected to them this way. Script actions are a special kind of processes that can call other processes. The called processes must be have the run condition set to this value.